Juelp's Daylight Defense is a lush, creamy balm that lasts a decent amount of time, similar to Carmex. The balm is "vanilla mint" and smells like Thin Mint cookies. The peppermint in the balm gives my lips a little tingle, which I find refreshing. CHECK IT OUT: Learn more at the Julep site. Julep is a subscription program for nail polish and other products. It's one of the few that allows you to opt out of the month's package and retain membership. Check out Buddha Balm. 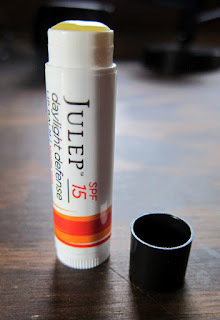 Sub $4 and the best lip balm out there. Great flavor as well.